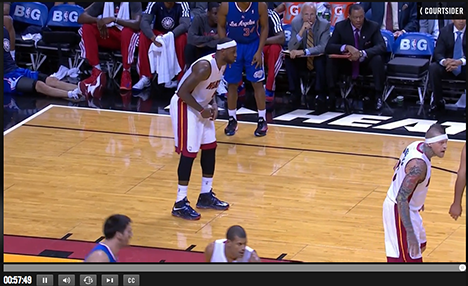 Overtime Extra is available for many NBA games broadcast on TNT. Check out the full 2013-2014 TNT NBA schedule, which is typically every Thursday night (and occasional other nights) throughout the season. 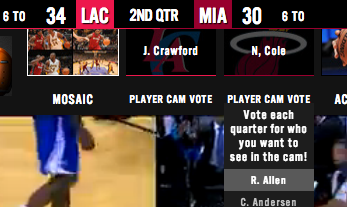 When you log on to TNT NBA Overtime, you’ll see the mosaic view which gives you 4 different camera angles at once with a scoreboard and stats at the top right. 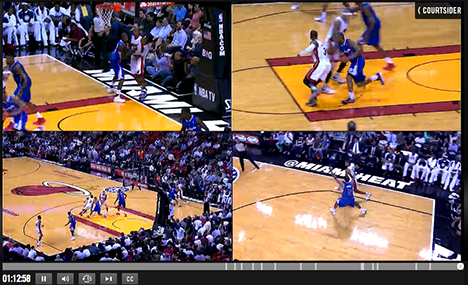 You don’t have to watch 4 cameras at once (Mosaic). You can select from a few different cameras which are found along the top of the screen. 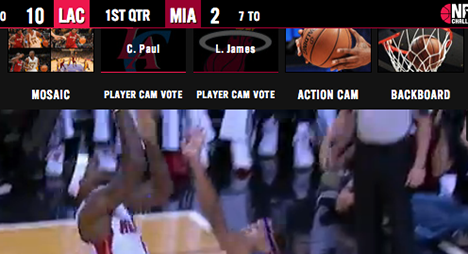 There is the Action Cam, which is probably you’re best option if you want to simply watch the game. In addition, you’ve got the Backboard Cam, and two individual player cams. Click one of the options to switch to a different camera. The individual player cams are interesting because they literally follow a player around constantly. Even during breaks when they are on the bench. Typically you’ll get a big star to begin the game, and then you can vote to decide which player gets featured in the next quarter. Controls appear at the bottom of the video when you hover your cursor over the area. You can use the controls to adjust the volume, jump to fullscreen, or even stop the video. Yes, there is audio. You get the feed from the TNT telecast. The cameras remain on throughout breaks and halftime so you can watch the players on the bench or shooting around when they are coming out after halftime. They do throw in the occasional commercial during some breaks.